This photograph was taken on May 17, 1917 at Ashland. 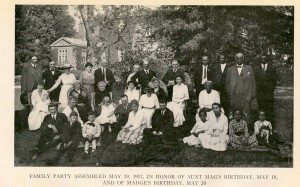 The family assembled for a party to celebrate the birthdays of “Aunt Mag” Magdelen Harvey McDowell and Madeline McDowell Breckinridge. The original is at the Univeristy of Kentucky in the HCMF McDowell Family Papers. Did your grandmother tell you you were related to Henry Clay? Did your Great Great Uncle Bob work at Ashland during the McDowell era? Does your family Bible say your ancestors were enslaved by Henry Clay? Did Great, Great, Great Grandpa Joe attend Kentucky University? If you have questions like these we may be able to provide answers! We maintain a large genealogical database, have voluminous records, and know where to find many more. We are pleased to share this information with you and will do our best to provide answers to your family history questions. Please direct genealogical inquiries to Curator Eric Brooks at ebrooks@henryclay.org or 859-266-8581 x203 or the address below. Please provide as much information as you possibly can and go as far back as your information permits. The more data you can provide, the better your chances of finding further answers at Ashland. Please allow ample time for research. It is generally a time consuming process and the curator has only volunteer assistance with such requests. It may be possible to schedule a time to do research at Ashland. This must be done under the supervision of the curator and within the confines of his schedule. Please make your inquiry well in advance of your desired research trip. The Clay Family by Zachary F. Smith and Mary Rogers Clay. Filson Club Publications No. 14. Filson Club, Louisville, KY 1899. This volume is probably the most definitive resource on the Clay family. It is somewhat rare and generally only available in Special Collections libraries. Henry Watkins of Henrico County by Jane McMurtry Allen. Gateway Press, Inc. Baltimore, 1985. One of two good resources on the family of Henry Clay’s stepfather Henry Watkins (who was not the one in the book title). Some Watkins Families of Virginia and their Kin by John Hale Stutesman. Gateway Press, Inc. Baltimore, 1989. the other good volume on the Watkins family. This one is a little larger and more recent. Genealogical Narrative of the Hart Family by Mrs. Sarah S. Young. S.C. Toof & Co. Steam Printers, Memphis 1882. This is the main work on Henry Clay’s wife’s family. It is also rather rare and generally found in special collections. Some Descendants of John Clay (Emigrant to Jamestown 1613) Through his son Charles Clay (ca 1638-1686) and his wife Hannah Wilson Compiled by Robin Clay Oliver. This source gathers much research on the larger family of which Henry Clay is a member and is a valuable starting point. It can be found and purchased on the internet. This website is managed by a Henry Clay descendant and is a tree of the Clay family of which Henry Clay is a part. UK Special Collections has several large and important collections of papers on Henry Clay and his family. This is an excellent starting point for research. Transylvania has a small but important collection of Clay papers. It also houses the records of the Kentucky University, the institution that owned Ashland from 1866 through 1882.